CATHOLIC GIFT SHOP LTD - Lourdes Water Gift Set with Miraculous Medal. 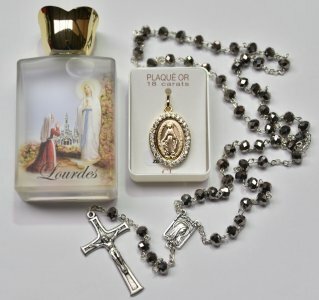 Lourdes Water Gift Set with Miraculous Medal. > Lourdes water in a square bottle with a colour image on the front of the bottle depicting St Bernadette kneeling to the Virgin Mary. This bottle measures 9 cm tall (3.5 inches) and holds 45ml (1.5 US fl oz) approx. > Lourdes diamond cut rosary beads hand made in Italy using the old processing techniques that have been handed down for generations in Loreto. Rosary measures 18 inches approx..